Can you afford to make the payments on a thirty year mortgage, increasing payment to pay it off in 15 years? Is it air tight or does the heat blow out when the cold blows in? Insulation, insulation, insulation: What is the quantity and quality of installation of the insulation? Does it have double or triple pane windows? Does it have window shades sealing three sides of the window and are those shades easy to draw every evening – they should last at least twenty years. Is the fuel choice consistent with local supplies? Solid fuel, oil, gas, propane, electricity. Electricity would be the most expensive per BTU, solid fuel would come from your own lot and be the least expensive. If two thru six are done well than solid fuel will be a small problem. The longer answer is also a series of questions; more detailed and perhaps more critical. The real answer here is to understand what is important in today’s world of housing, as well as what is truly important to you. Does this house work? Are the kitchen, bathroom, and master bedroom stacked so that only one small part of the house needs to be heated? Is the garage door such that you can automatically drive in and have ample room to empty the car into the kitchen with the door closed? 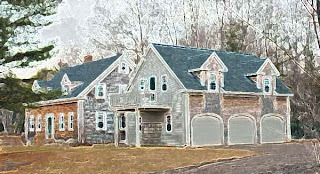 Does the building shed water or does it have so many dormers, siding variety, porches, decks, chimneys, angles and corners that it will be a nightmare to maintain? These features catch water in hundreds of places causing rot. This is the base point for me: The entire exterior must be dry shortly after the rain stops. None of today’s "McMansions" meet this criteria and will be neither maintainable nor saleable. And last, but really first, do you like it? It takes us sixty hours to teach this encyclopedia, to understand the substance of what “liking” a house really means. I write this with Patsy in mind and the many ideas she and I developed together.